The recent 787 fire at Heathrow Airport in London appeared at first to be a relatively minor event with a limited impact beyond the aircraft involved. However, when the investigative authority, the Air Accidents Investigation Branch (AAIB) of the UK, released its preliminary report on the event, the recommendations that were made implied that the problem had the potential to be far more serious had it occurred in flight. The initial AAIB report, stated that the fire damage coincided with the location of the emergency locator transmitter (ELT), and although the AAIB did not state that the ELT was the source of the fire, the aircraft was unpowered at the time of the fire, and no other aircraft systems in the area contained an energy source capable of starting a fire. The ELT is designed to operate without any power from the aircraft's electrical system, and is powered by a set of chemical batteries using a Lithium-Manganese Dioxide (LiMnO2) composition. This kind of battery represents a different technology from the lithium-ion batteries associated with the fires on two different 787 aircraft in January 2013. According to the AAIB, when fire fighters entered the aircraft through the front left door (the 787 has four pairs of doors), they encountered thick smoke and had to open at least two other cabin doors to clear the smoke. They were unable to extinguish the fire with a handheld Halon fire extinguisher, and had to forcibly remove a ceiling panel and use water from a fire hose to put out the fire. While this was apparently not an complicated procedure for the fire crews on the ground, it could have been an entirely different situation had this occurred in the air. While there are handheld fire extinguishers in the cabin that flight attendants can use in an emergency, equipment or other tools suitable for removing ceiling panels are not typically available to cabin crew. While the fire fighters in the London incident had access to water hoses to put out the fire, no such option would be available to an airborne 787.
in the event of an onboard fire, typical emergency procedures include landing at the closest suitable airport, but since the 787 often flies on routes that are an hour or more from a suitable airport, passengers and crew could be exposed to large amounts of smoke and fumes for a significant amount of time. Emergency oxygen systems may not have been useful for passengers since these systems are typically designed to supply supplemental oxygen, in other words, passenger would be breathing a combination of oxygen from the emergency oxygen system and ambient air from the cabin, including any smoke or fumes that are present in the cabin. 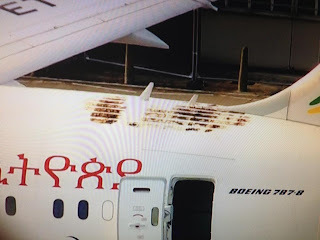 Simply put, the aforementioned conditions imply that had this event occurred in the middle of a flight, the cabin crew may have been unable to reach the source of the fire, and even if they did, they may not have been able to put the fire out. The aircraft involved in the fire at London's Heathrow airport sustained damage to the composite structure of that airplane's fuselage. Conceivably, if the fire had been allowed to burn for a significant amount of time, a situation that could have occurred had the airplane been inflight, the fire could have led to significant damage to the aircraft's systems, or could have caused the aircraft to lose its structural integrity. Either outcome could have led to the loss of the aircraft and all on board. While the previous scenario may be disturbing to the average passenger, what may cause additional concerns, especially to aircraft manufacturers and airline operators, is the possible role of the ELT in the fire in London. This is a system that is noteworthy for not being a source problems that could lead to the loss of an airliner. In fact, according to the AAIB, the manufacturer of the ELT involved in the London fire, Honeywell, has produced some 6,000 ELT units of the design used in the Ethiopian 787 involved in the London fire event, and that event is the first incident where the ELT system generated a significant level of heat. Following the recommendations of the AAIB, the FAA and other regulatory agencies around the world have ordered that 787 ELTs be deactivated, inspected, or removed. Until the AAIB, Boeing, and Honeywell figure out the role played by the ELT in the London fire, questions will remain as to whether the 787 ELT represents an unexpected and potentially fatal risk to 787 passengers. Complexity in action. A super complex electrical system, innovative composite structure, pilots becoming button-pushers, computers taking over.... Future complex systems/products will become source of problems like these if complexity is not taken into account in the design phase.